The minimalist designer Roca Gap 450mm wall hung square cloakroom basin with semi pedestal, part of Roca's collection of luxurious wall hung vitreous china sanitary ware, with its functional and compact design this basin and semi pedestal provides a modern and stylish solution for optimising any bathroom space. Manufactured by Roca using the best materials and production methods, this means products are more resistant, durable, easy to use and maintain. All Roca ceramics are covered by a 25 Year Guarantee. 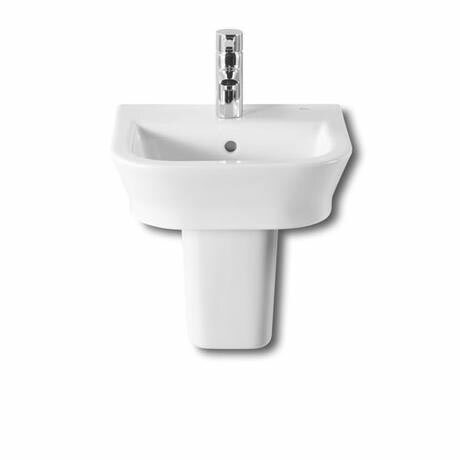 Cloakroom basin is supplied with a wall fixing kit. The wall hung cloakroom basin from Roca is the ideal solution to saving space in a bathroom that doesn’t offer it in abundance. Its stunning design is courtesy of designer Antonio Bullo. It is made from vitreous china and is therefore hard wearing and durable for the everyday uses of the bathroom. Its wall hung element make it both space saving and easy to clean making it a favourite for any modern household.